As I sat in my hot un-air conditioned room last week, I thought to myself, "You know what you're missing? 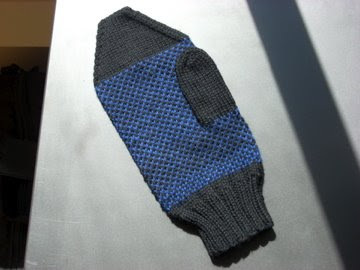 A nice, toasty warm pair of mittens." Now, although this thought it completely accurate as I do not own myself a pair of mittens, to be having said thought while simultaneously trying to derobe myself to a state just before indecent seemed a bit peculiar to me. In any case, when the knitting bug bites, all we can do is to scratch and hope for the best, right? I dug through my stash, found some yarn that would work (and then dug through ravelry and found a pattern) and got to work. I have been wanting to try stranded knitting for a while, so I figured now is as good a time as any! 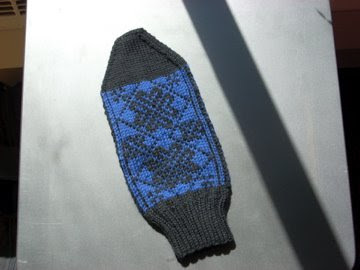 So far I have completed one mitten. 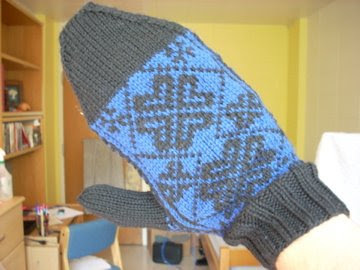 The pattern is from the Winter 2006 Knitty and is called Corazon. As my hands are massive, I am knitting the largest size. I also didn't bother to figure out my gauge, I just sort of trusted the yarn. I'm using some Knit Picks Swish DK in Coal and Dusk. I wasn't sure how the black and blue would work out with the patterning, but I kind of like it. I did most of the knitting on this mitten while at home for the weekend. It was a very quick knit (once I figured out how to knit with two colors at once). I may go back and rip out the finger area and re-knit it with a less pointy decrease. I think I would prefer a rounder end than the one in the pattern. Oh, and guess what! My Swan Lake Stole is finally blocked and drying as we speak, which means that there is inevitably a photo shoot coming your way. is that your first try at stranded knitting? i've always wanted to learn to do that, but haven't yet. they look great, and once you get that second one done, you'll be all ready for next winter. let's hope it's not quite as bad as this past one! 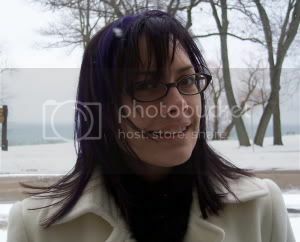 while i like snow, it got a bit ridiculous, didn't it? Nice mitten! And hey, I can't tease you about mittens in June, since I just knit myself a whole wool *sweater* in June, which is even crazier! 1. Noro is going to kill me. Now that I knit that one little project I'm in love with Silk garden and what to cover everything I own in a cozy made from it. 2. The baby sweater is from Knit2Together. It's the very first pattern in the book. The pattern calls for DK weight yarn but mine is knit in worsted to make it super thick and warm. The blanket is so easy for how nice the end result is but I can only work on it when there is other stuff going on because it's pretty mindless. Also, I hate Red Hart yarn but it's cheap. 3. Yes I love Knitpicks and spend too much time on their website drooling over new colors and fibers to try. Now that I've tried dyeing I've started eying their bare line too. Your lace is so wonderful that one technique that I'm determined to try this summer and I hope my results are half as good as yours. Happy knitting!